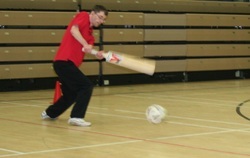 There are currently two versions of blind cricket played in England. The first of these is a domestic game played with a soundball similar to a size three football. The second is played with a smaller soundball which is a similar size to a conventional cricket ball and are imported from Pakistan and India. A blind cricket team comprises of both blind and partially sighted people. At least four of the team must be totally blind. There are adapted rules dependant on the level of a player's vision. SAVI aims to develop both versions of the game and has established links with the domestic and international game. The co-ordinators themselves actively participate competetively.